Geothermal power is growing rapidly across the globe. What does this mean for residential construction? Today’s kitchens are filled with all kinds of gastronomical gadgets, from coffee bean grinders to indoor rotisseries. You have everything you need to prepare five star cuisine, yet kitchen trends are leaning toward minimalism. That means you can show off your white marble countertops, commercial range and custom backsplash, if you put away the other appliances and tools you need, even if you use them daily. So, where do you store your food processor, blender, toaster, chop-pow and other essentials? If you’re like most of us, it’s easier to just leave them out, but too many appliances and devices can clutter a kitchen, making it harder to keep clean, reducing your workspace, and wrestling with your peace of mind. Here are a few ideas to help you keep your kitchen attractive yet functional. As the social center of the house, kitchens are catch-alls for school books, correspondence, and other items that have nothing to do with cooking. If there’s a place in your mudroom for kids to dump their coats, and backpacks, that will keep your food preparation areas a little cleaner and neater. Which appliances do you use the most? Chances are it’s not the ice cream maker, breadmaker or heavy mixer. Pare down what you tend to use least, and store those appliances somewhere else, such as a hall closet, butler’s pantry or pantry. Of course, you have to make room to store big countertop appliances. While it’s great to have a turkey platter, you only use it in November or December, so it doesn’t need to take valuable space in a working kitchen. If an appliance is too heavy to bring out and put away on a constant basis, maybe you need to leave it in reach. Some appliances, like the colorful KitchenAid commercial-quality mixers can provide a fun cobalt or orange accent to your kitchen décor. One way to hide infrequently used appliances is an appliance garage or caddy. Many cabinet makers offer an appliance garage or bread box that can be closed when not in use. Appliances can be put on a furniture moving pad or trolley to pull it out and to easily push it back in place. You can also customize an appliance garage to extend beyond the bread box size to the length of the counter. The at-home coffee bar is a great way to get coffee, tea, and other beverages and their bean grinders and kettles away from the food preparation areas. A coffee maker can be built-in or it can be left out, without creating an issue for the preparation area. All of the accompanying materials such as sugar, creamer, and lemons can be stored nearby, ideally within a small beverage or wine cooler refrigerator. Who doesn’t love fresh fruit, but food left to ripen on a counter-top can get soft and mushy. Banana ripening caddies turn bananas into cheerful offerings, and they can also be used for stemmed tomatoes. Use a decorative bowl to house a dozen oranges or apples and use it for a centerpiece on a breakfast table. Buy hanging mesh baskets to hold fruits and vegetables, taking care to hang them out of the way of traffic. If you don’t already store your shopping lists on your cellphone, create a place in your kitchen to hang messages and notes away from traffic areas. Bits of paper, mail, and receipts look messy in the kitchen, so keep them under control with a bill organizer or a family in box. Move correspondence to the home office or create a special meal-planning desk to pay bills, research recipes, and make your calls. It’s tempting to keep out the antibacterial cleaners, glass cleaners and other cleaners we use several times a day, but they aren’t attractive. Create an easily accessible place under the sink for such items. If bending down for the items is difficult, install a roll out tray or place your cleaners within easier reach with a basket on the inside of cabinet door. The best way to reduce clutter is to consolidate, such as getting a new microwave that also serves as a convection oven. New wall ovens can be purchased that offer many options that eliminate small appliances from the counter-top. 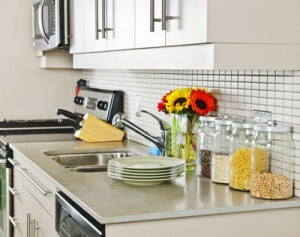 Under cabinet mounting is easy to do and frees up counter-tops near the sink. Paper towel racks, electric can openers, and task lighting can all be mounted under the cabinets to free up space. Dishrags, sponges and other odor attractions should be housed in caddies attached to the door under the sink for easy access. Deep cabinets are difficult to find items all the way in the back, but a rolling tray makes them accessible. Corners also can be better utilized with swing out organizers. Most carpenters, handymen, or do-it-yourselfers can easily install after-market organizers such as spice racks from Lowe’s, the Container Store and other places. Keeping your countertops clutter-free doesn’t have to be all work and no play. Let the kitchen’s function inspire your décor. Hanging containers of vegetables, mounted pot racks, and bowls of fruit certainly cut down on clutter, but they also provide a lot of color and function. It’s been 4 years since I had snow boots custom made for my Italian greyhound. She’s never walked in them properly – the first time we put them on her she bucked like a horse. Another attempt had her going down an entire flight of stairs just on her front legs. At that point I usually give in and take them off. This morning, walking after the first snowfall of the season in Seattle, after about two blocks she held her feet up as if she had something stuck in there (like a baby slug, whch does happen). I took off my mitten and went to each foot to check. As I felt each foot she started to cry louder and louder, milking this situation for all she could get. I managed to get her going again and she was fine in the sunny areas but in the shade she would slow down and I would have to encourage her. So this afternoon we’ve been working with her in the boots. After this video was shot I offered her her lunch and left her standing there staring at me for about half an hour, as she began expressing herself with an under-the-breath whine that then became a quiet but steady whine with every breath. I put a leash on her and she followed me to the couch and jumped up and I got her to lay down with her legs out to the side. After about 20 minutes she put her head down and sighed, which indicates submission. After about 5 more minutes I removed the boots. The Dog Whisperer would have been proud. Tonight we will be going out and she will be wearing her boots. I don’t know if she will be able to do her business tho from the anxiety and distraction. We shall see. Have you ever heard of Better Homes and Gardens? Of course you have. For those of you who haven’t heard much about the real estate part of the Better Homes and Gardens brand (yeah, that glossy magazine), here’s a free video you can download to your iPhone or iPad or computer to watch. I joined this firm in October and I am still digging through all of the resources available to me as an agent and it is pretty exciting. If you are considering the next company to work with or for, as a client or an agent, you should take a few minutes and learn more. The local franchise is Better Homes and Gardens Real Estate Executive and there are 5 offices, all of which I can use to meet with people or pop in to use equipment. It is a great time to buy for many would-be homeowners. The market is offering historically low interest rates, as well as affordable home prices. Realty Times has put together 10 steps buyers can take to make home dreams a reality. I wanted to take a couple of minutes and let you know about two great programs out there if you purchase a home and it needs some work. The first of these is the FHA 203-k loan and it allows you to buy a home, fix it up and roll the costs of construction (there are limits-be sure to check with me or another loan officer before proceeding) into the loan. The FHA 203-k loan is a great loan for those of you who aren’t afraid to buy a fixer. Understand that FHA loans are for owner occupied homes only so you need to live there. But I know people who have done these loans and been able to not only get a great buy but fix their place up nicely. In sum, the FHA 203-k loan can be a great way to go; especially if you don’t have the cash to do the repairs yourself or only 3.5% to put down on your purchase. The second loan program is the Fannie Mae Homepath Renovation loan. I’m pleased that The Legacy Group is able to offer this product as not all lenders are. The Fannie Mae Homepath Renovation loan is very similar to the FHA 203-k loan mentioned above. The difference is the Fannie Mae Homepath Renovation loan is for Fannie Mae owned homes only. With so many homes being foreclosed upon these days, there are also quite a few that are owned by Fannie Mae. If a home is owned by Fannie Mae, the only loan program that might be available is the Homepath one (especially if you put less than 20% down). In sum, thanks for reading about these two great renovation loans. You may not have been aware of them before this but you are now! Real Estate Prices Fall, Will Sellers Take Note? Good news or not, depending on which side of the deal you are on.